May 15th – June 28th, 2015. Opening Reception: FRIDAY May 15th from 7pm to 10pm. Participation in the present moment implies the tacit adherence to a cult of certain contradictions. This is a world of crossed messages, symbolic traffic, and sudden transformations in which it becomes clear that there is no idea of “sense,” beyond that present in the multiple nature of this concept. This is an exhibition that takes this basic problem as a point of departure. 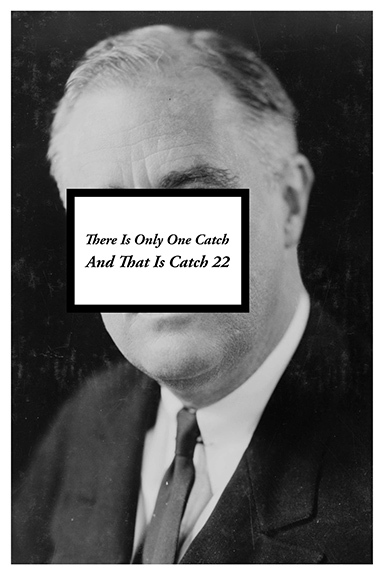 Catch 22 is a logic trap initially suggested by Joseph Heller in his eponymous novel published in 1961. Set during the II World War the novel develops this idea but in close relation to the operating area of ​​military bureaucracy, strict and absurd at the same time. The term later became part of the English vocabulary because of its accuracy to refer to certain unsolvable puzzles in which the only way out is denied by an inherent fact of the problem itself. Furthermore this impossible scenario appeals broadly to current circumstances such as arbitrary political decisions, militarism, and absurd bureaucracies worldwide. The artists included in this exhibition provide works that connect to different explorations of what is considered a biconditional tautology. The works outline different vanishing points, either referring to military and political connotations of this construct; or to that section of invisibility of certain processes or social situations, as well as the efforts to maintain that invisibility. On the other hand, the technique chosen by each artist plays a key role in representing this paradox by operating as a dialectical device that allows us to enter the circuit where the intractable political liability inherent to the material sets its own speech and takes us into the eternal dilemma of the concept before or after its formal resolution. Thus, the works venture into a double connection with the Catch-22: the conceptual approach of them, together with the hoop stress and the disorder between the material and the concept represented, which also canceled its value in use and intensifies the fetish of merchandise.